Ah, Spanish Rice. It makes me think of one of my favorite Mexican restaurants in my home town – the type of place that serves huge combo plates of Spanish Rice, refried beans and carnitas, all covered in cheese. 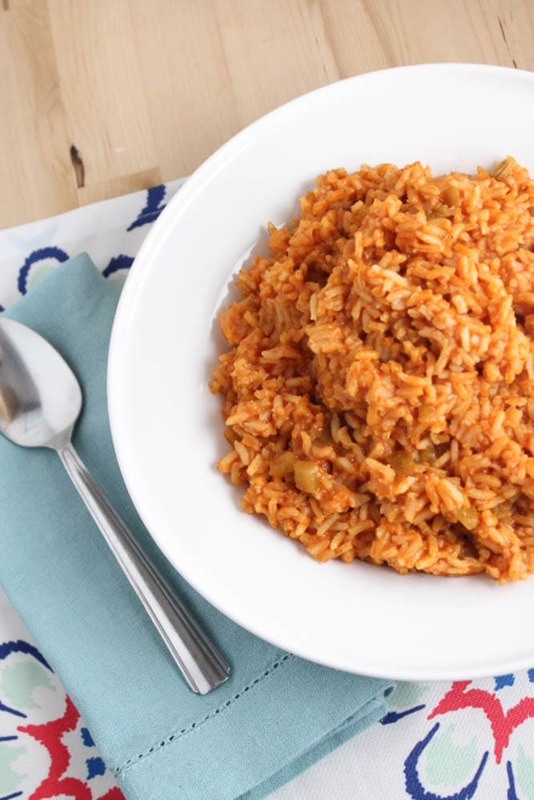 For years I ate Spanish Rice in restaurants and for some reason was overwhelmed by the idea of making it at home, but once I looked at a few recipes, I saw how easy it really was. When I finally made it myself, I couldn’t believe I hadn’t done it before. We’re moving next week, which means this week we’re starting to pack everything we own into boxes, and we’re eating everything that’s not part of our most basic food storage. All I have left to cook with is basic, shelf-safe staples, (along with my weekly produce) and the most essential cookware. Luckily, this recipe only requires 5 or 6 basic ingredients, and a pot. I should explain that this dish isn’t really Spanish, but Mexican in origin. 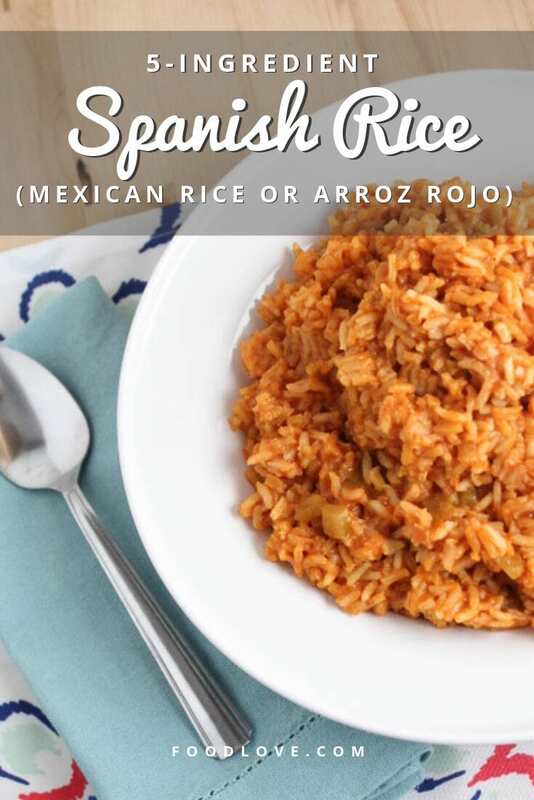 It’s more properly called Mexican Rice or arroz rojo. It’s a version of the popular side dish served in Mexican restaurants in the United States. I cheated a little in calling this 5 ingredient Spanish Rice, because I added diced green chiles to mine, but the chiles are totally optional. 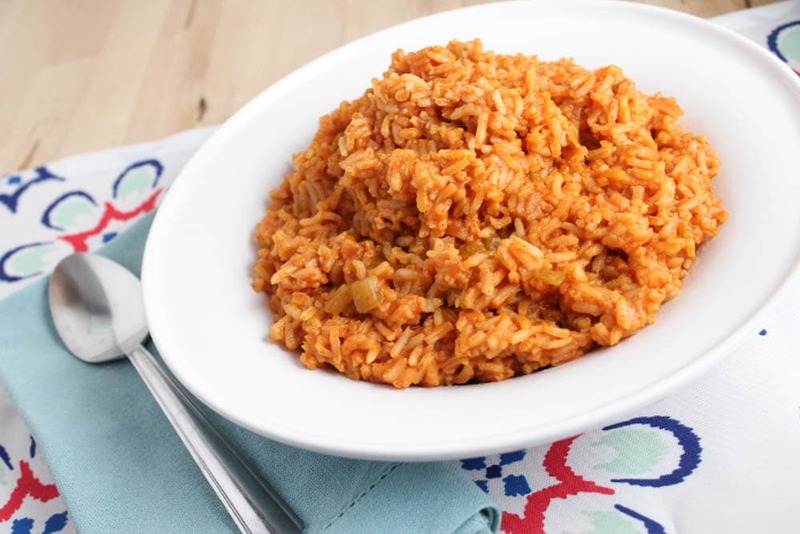 The great thing about Spanish Rice is that once you have the recipe and process down, you can make however you’d like depending on your tastes or what you have in the pantry. Sometimes I like to add fresh peppers and onions, change up the spices, or substitute salsa for tomato sauce. This recipe was also perfect for a moving week because it’s so simple and quick to prepare. It literally takes 5 minutes to get everything ready, then it cooks for 20 minutes, and it’s done. One step I really don’t recommend that you skip when making Spanish Rice is lightly toasting the rice before you cook it. 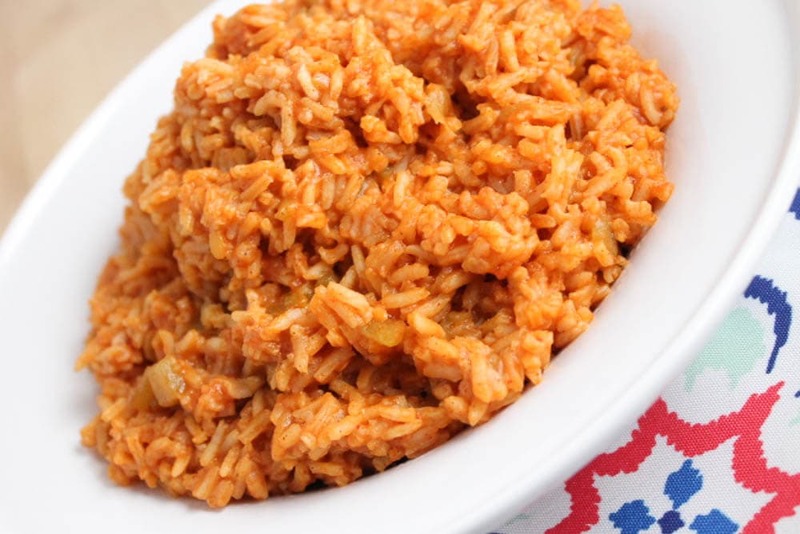 The first few times I made Spanish Rice, the recipes I worked from didn’t say to toast the rice, and I was always disappointed by the texture; it turned out too clumpy and mushy for my taste. 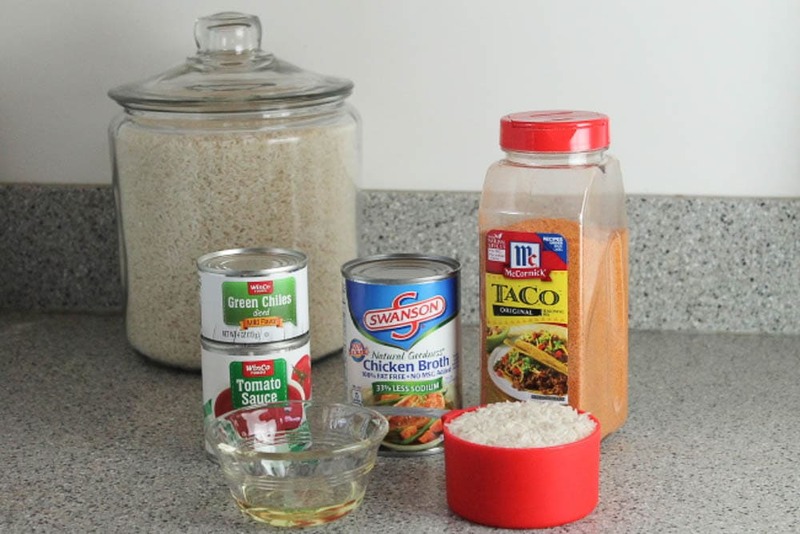 Tonight I’m serving this rice in tacos with my Best Ever Mexican Black Beans, but I also love adding it to burritos and enchiladas with my favorite Crock-Pot Cilantro Lime Shredded Chicken, or just serving it as a side dish with a variety of main courses. 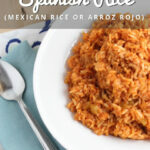 This quick and easy restaurant-style Spanish Rice (Mexican rice or arroz rojo) is a perfect side dish. Made with only 5 (or 6) ingredients, it's simple and delicious. Add chicken broth*, tomato sauce, diced green chilies, and taco seasoning and stir to combine. Using a fork, fluff the rice and incorporate any tomato sauce that has come to the top. You can substitute the chicken broth with vegetable broth and easily make it vegan! Regular, long grain white rice. Unfortunately Minute Rice doesn’t really work with this recipe. Way too much taco seasoning. As a Mexican-American, I know that my cultural cuisine will be edited to creative chefs making delicious meals at home to their loved ones. But please understand that it is an insult when you title Mexican rice as “Spanish rice”. Spanish is a language or it is a term used for people who are from Spain. 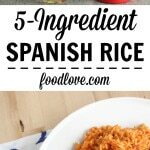 You are intending to make Mexican rice, not a rice from the Spanish cuisine. Please fix your title. Thanks for writing! We would never want to insult Mexico, its people, culture or amazing cuisine! Of course we understand the differences between Mexico, Spain and the Spanish language. We’ve changed the title to make it more clear that the dish is from Mexico and not Spain. Great and quick recipe. I was worried when someone posted that there was too much taco seasoning, but I didn’t find that to be the case at all. Thanks, Jamie! We love this easy recipe with tons of flavor! Any chance you’ve tried this with brown rice? Do you have any idea if that would work? Looks delicious, looking forward to trying it. Yes, I have thought about brown rice! I like brown rice more than white. Unfortunately it doesn’t work well with this recipe/cooking method. I wish it did!